This date cake is a great dinner party recipe as a cheese plate element that vegans and vegetarians can enjoy. One of the things I enjoy most about cheese plates is the opportunity to showcase a cultural cuisine. Cultural context provides a theme to the arrangement, a little gourmet flair, and a stage for learning and appreciation. Enter pan de datiles, a Spanish date and walnut cake that's practically cheese plate pep-talk in food format. This pressed cake of dates and nuts is the perfect addition to an Iberian-cuisine cheese plate. 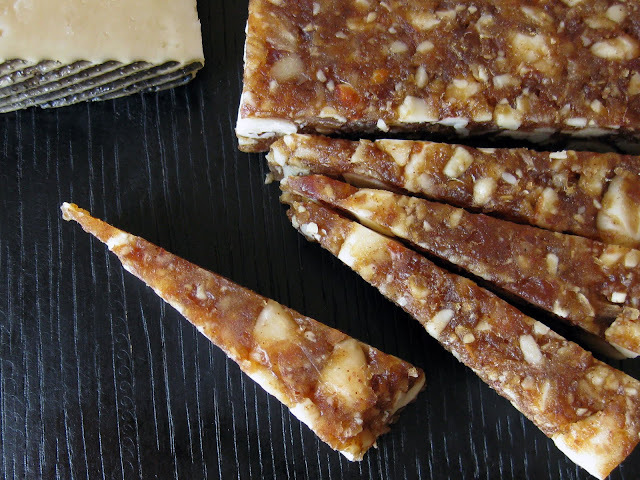 It also makes an excellent vegetarian hors d'oeuvres, vegan party food, or paleo snack. If I gave a pep talk to sad cheese plates, I'd definitely let them know they can become the pièce de résistance at any gathering if done well: something to appreciate and explore, not just something to tide people over. When there are so many things about cheese plates to love (versatility, complex flavors, and centerpiece-worthy arrangements), it can be sad to see them so often stuffed with yellow cheese cubes and relegated to picnic snack status. Cheese plates everywhere: achieve your dreams! Pan de Datiles is a pressed date cake made from dates and nuts. It is sliced and served with crackers and cheese. 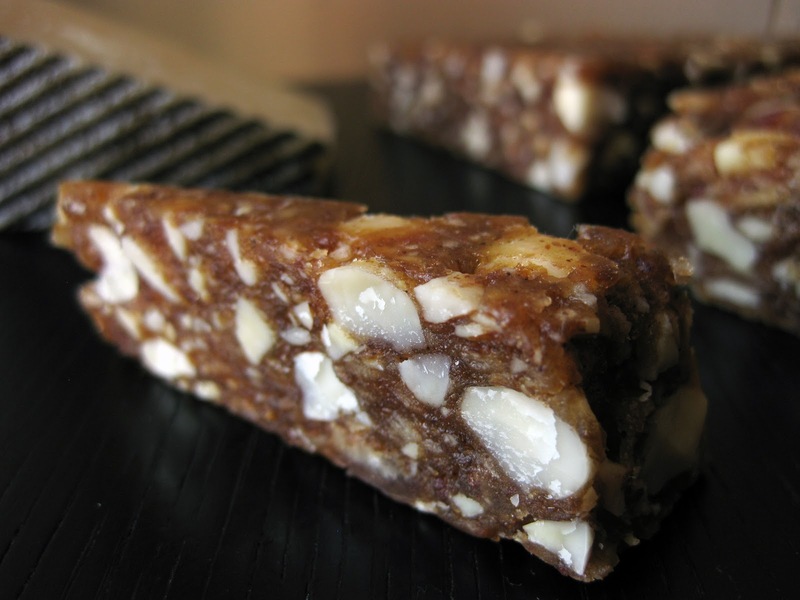 Dates and toasted almonds compressed together make for nutty flavors and raisiny sweetness in this Spanish treat. Pair it with crackers, some Spanish cheeses (Manchego, in particular) and other regional highlights (Marcona almonds, Pedro Ximenez or oloroso sherry), and start celebrating! Cured meats, even ones that aren't from Spain (finocciono in particular, an Italian fennel salami), would also pair nicely. Make the cheese happy. This dense Spanish date and nut cake is a good vegetarian hors d'oeuvre or vegan party food. 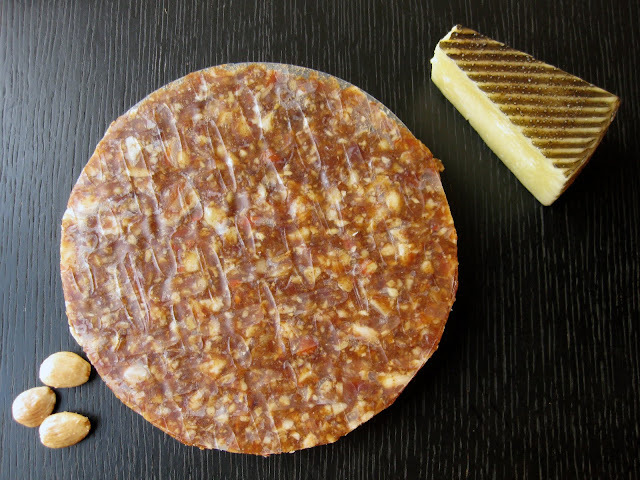 You can sometimes find pan de datiles at a local fromagerie or in the cheese section of your local grocery store. Unfortunately, these imports from Spain are often pricey, and sometimes they're no longer fresh (read: rock-hard) or have been made without traditional flavor-enhancing spices. 1) Toast almonds lightly in the oven (350 F for about 5-7 minutes). Careful not to over-do otherwise they'll take on a bitter taste (or burn). They should become fragrant and barely change color. While you're waiting, you can roughly chop the dates with a chef's knife (helps you discover any pits, and preps them for the food processor). 2) Place the toasted almonds in a food processor and roughly process so that some halves still remain. Set aside. 3) Place the chopped dates in the food processor along with the remaining ingredients (honey, brandy, cloves, cinnamon, salt) and process until the dates are chopped and ingredients are mixed. You don't need to grind it into a paste...leave some chunks in there for a "rustic" look. Place this mixture in a bowl with the almonds and knead to mix. 4) Draw and cut two 7-inch diameter circles out of wax paper or parchment paper, or use two rice spring roll wrappers (I used the spring roll wrapper method as seen in the photo below and in the top-view photo above. The were conveniently about 6.5 inches in diameter). Spoon the date mixture into one of the circle areas to form a roughly 1- to 2-inch thick disc. Press gently into shape and top it with the other paper/rice circle. Place between two sheets of wax paper, and set several large heavy books on top to help compress it into a flat, even disc. Let rest several hours or overnight with the books on top, and it will become more slice-able. Before serving, trim away the excess to perfect the disc shape, remove parchment paper or rice spring roll wrapper, and slice thinly. I sandwiched the mixture between two round spring roll wrappers, pressed it, and then trimmed away the excess. You can get a good look at the rice spring roll wrapper method in the photo above. Dry spring roll wrappers are the perfect pre-measured circles, but they don't slice up too nicely and they don't taste very good either. Make sure to remove them before slicing and serving. 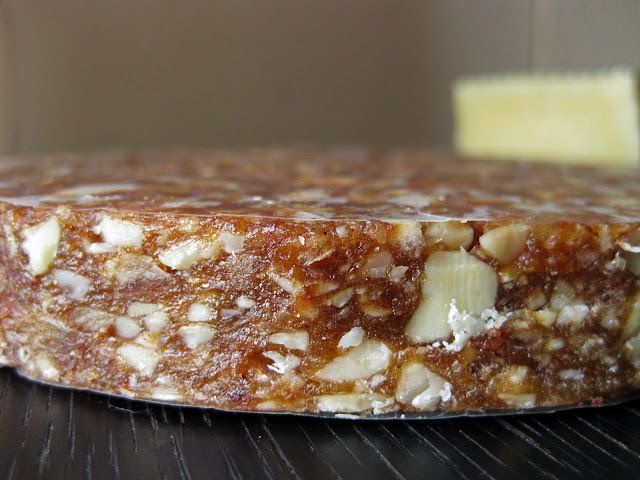 Below are photos of my "research subjects" - two pressed date nut cakes (one with walnuts and the other with almonds) imported from Spain that I sampled to get a taste of the competition. 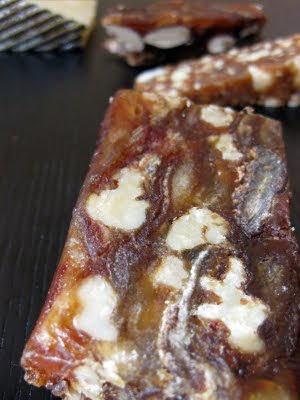 These products were delicious, but really quite simple: they are no more than dates and nuts pressed together. As you cut into them, you can see whole dates layered on top of each other with almonds caught in between (like a delicious sedimentary rock....geology 101: dropstones). I bought this walnut date cake at my local grocery store to taste it and learn how it was made. 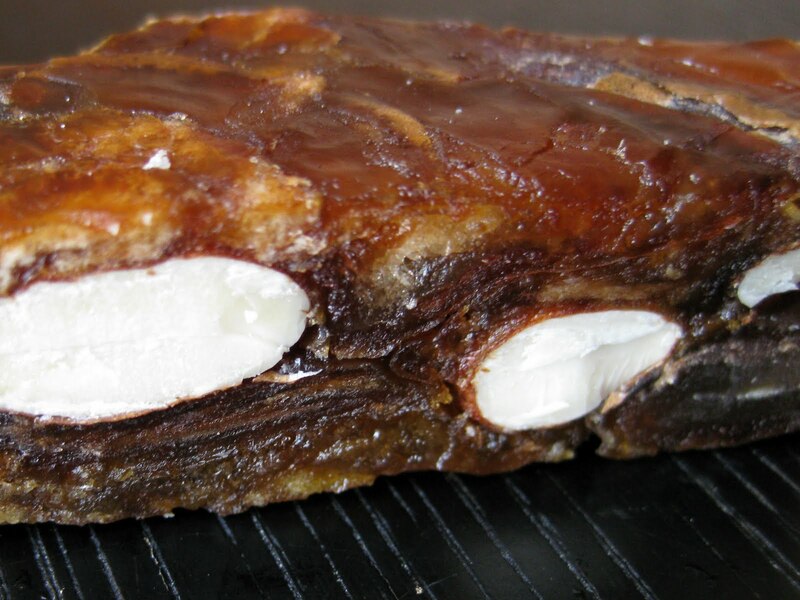 A pan de datiles spanish date cake I bought to examine, taste, and learn from. It might be possible to make such a minimal date nut cake at home, but you'd need something really heavy to compress the two ingredients. I avoided this problem above by grinding everything just enough to make sure it would stick together. Good luck assembling your cheese plates and collecting hors d'oeuvres recipes! Enjoy! pant pant pant! I can just taste this with cheeses, fruit and a lovely red wine. Thank you! Thanks, cavewomancafe! I have to admit...the Manchego cheese in the photos above did not go to waste! They were very tasty together! So happy I found your site. Hope to make this recipe, it looks great! how do you get it to stay in a circle? Once you put the weight of the books on it doesn't it just flatten out? This looks Delish BTW!